The Royal Marines Bands are based in Portsmouth, Plymouth, Scotland, at the Commando Training Centre and the Royal Naval College, Dartmouth and their roles are to provide military bands, orchestras and dance bands for state occasions, major national and service events and for ship and shore ceremonial and social functions. The Band Service currently numbers about 400 men and women and its training school (Royal Marines School of Music) is based in Portsmouth. The Royal Marines Museum at Eastney in Portsmouth has got a new exhibition which includes a film about the Bands of the Royal Marines and a variety of pictures, text and other related exhibits. There is also a listening room where you can listen to different Royal Marine Band Music. The Royal Marines Massed Bands have performed Beat Retreat a number of times in Portsmouth since their move, once in 1996 and once in 1999 before performing it in Horse Guards in London. They have also performed at many other events including one at the Royal Marines Museum Eastney. The Royal Marines Bands are regarded by many as experts in providing military music in both the marching and concert arenas. The Royal Marines Bands members not only provide music they have a very important role to play as operational soldiers and have performed operational roles in both the Falklands conflict and Operation Granby as casualty handlers on hospital ships. More recently they have deployed to Kosovo. The beat of the drum enabled columns of soldiers to march and keep a regular step. The drum was also used as a means of signalling on the battlefield. In 1767 the Royal Marines Divisional Bands were formed and these were based at Chatham, Plymouth, Portsmouth and Deal. It was not until 1903 that the Royal Naval School of Music was founded to provide Bands for the Royal Navy. The bands original home was in Eastney Barracks where it remained until 1930 when it transferred to Deal. It then moved to Malvern after the Second World War. It then divided into the Junior Wing and Senior Wing, with the Junior Wing moving to the Isle of Man and the Senior Wing moving to Scarborough. Both wings reunited in Burford in 1946 and returned to Deal in 1950. The Divisional Bands amalgamated with the Royal Naval School of Music in 1950 to form the Royal Marines Band Service. The headquarters and training sections were also renamed the Royal Marines School of Music. This brings us to the present day with the Royal Marines School of Music currently being based in Portsmouth at HMS Nelson. The Royal Marines musicians are regarded as one of the most versatile group of musicians in the world. The Corps of Drums are also highly regarded and maintain the highest standards of drill, bugling and drumming. Royal Marines student musicians are taught by professors of the highest calibre as well as being drilled in all aspects of military ceremonial. The Royal Marines Musicians and Buglers, as well as providing spectacular musical ceremonies, also are trained in military operational roles. Royal Marines Bands people were involved in the Falkands conflict, Operation Granby and Kossovo. The Bands are world renowned for their splendour and precision. One of the most common ceremonies performed by the Royal Marines Bands is the ceremony of Beating Retreat. The ceremony of Beating Retreat is much more than just a collection of music; its origins date back hundreds of years. One of the first references to such a ceremony was made in 1554 when it was called Watch Setting. The original call was beaten by only the drums and it was many years before fifes were introduced and then bugles before including a full band as is present in the current ceremony. In 1799 the General Regulations and Order for Conduct of the HM Armed Forces in Great Britain laid down that they shall beat at sunset and this has been present in all editions of the regulations right up to the present day. 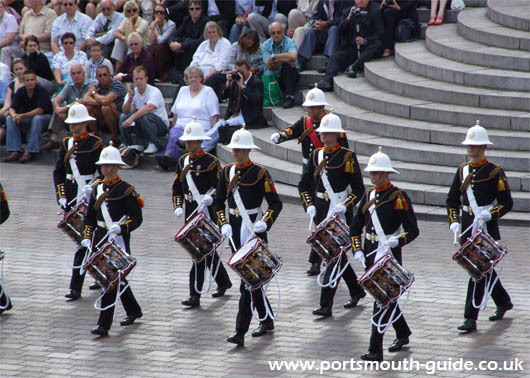 The origins of the Royal Marines Bands in Portsmouth can be traced back to the middle of the 18th Century. It was during the reign of King Edward VII that the band first performed on board the Royal Yacht and was soon appointed as the permanent Royal Yacht Band, which they performed until the decommissioning of HMY Britannia on the 11th December 1997. During their service in the Royal Yacht the Band visited and played in many parts of the world.